When you’re dealing with software built using Microsoft Windows Installer, you may experience various setup problems, especially if you perform multiple installation/uninstallation processes during the same Windows session. 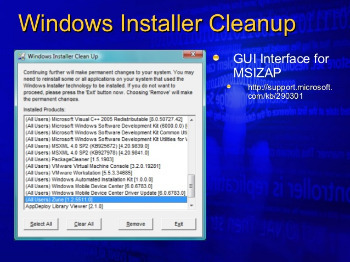 If you bump into this sort of situation, Windows Installer CleanUp Utility may help you to solve the issue without the need of a system restart. If you are one of those people who like to perform a regular cleanup on their computer by uninstalling programs, but later realize that you need them again, you should always have this software close by. Generally, when you run an installation process for an application that was previously uninstalled, errors are bound to appear. This little utility was built for one purpose only: to remove the Windows Installer configuration info from any program residing on your system. All traces of the Windows Installer settings for each program are cleaned up, thus making room for a new setup process. After a quick installation process, you encounter a standard window where a list of installed software is displayed. You are now free to remove anything. A piece of advice is to handle with care, because you may need to reinstall some or attention, ALL of the applications that rely on Windows Installer. Once you hit the ‘Remove’ button, the changes are permanent, so carefully decide if this is the solution for you. Keep in mind that consequences are serious and it should be used with the utmost caution.